This project was challenging as it involved dredging of sand, rock and marine mud including acid sulphate soils. Later, after the channel opening, strong tidal currents also increased the challenge. At commencement, the project area was an estuarine shoreline comprising oxidized dune sands which overlay tamala limestone. As the estuarine shoreline was approached, this quickly turned to sticky black marine sediments with high organic content. As the project had some objection from environmental groups no materials were allowed to be removed from the site. All dredge spoil and marine sediments had to be placed into bund enclosures with water outflow to contain zero solids content. The containment bunds were built in the estuary shoreline to enable them to be full of water and in order to move the shore line outward. CGC dredging was a sub- contractor on this site. Our project area commenced near the traffic bridge and ended about 300 metres out into the estuary in a big funnel shape. The dredging was run 24 hours per day, 6 days per week. After the reclamation bunds were built the first process involved sediment dredging from the estuary end and this was done by CGC’s bucketwheel cutter suction dredge ‘Mudlark I’. Mudlark delivered the 180,000 m3 sediment to its lower layer destination below water level to avoid acid generation from atmospheric oxidization. The second process involved filling over the mud deposition areas by dredging approximately 400,000 m3 of sand and limestone from the old dune areas. CGC’s dredge ‘Cooper II’ was fitted with its crown head cutter to undertake this project. Tree roots were a constant problem and we developed ways to reduce entry to the pumps. Low ground pressure machinery was used to access and maintain the reclamation. The final levels were contoured to form passive recreational areas. 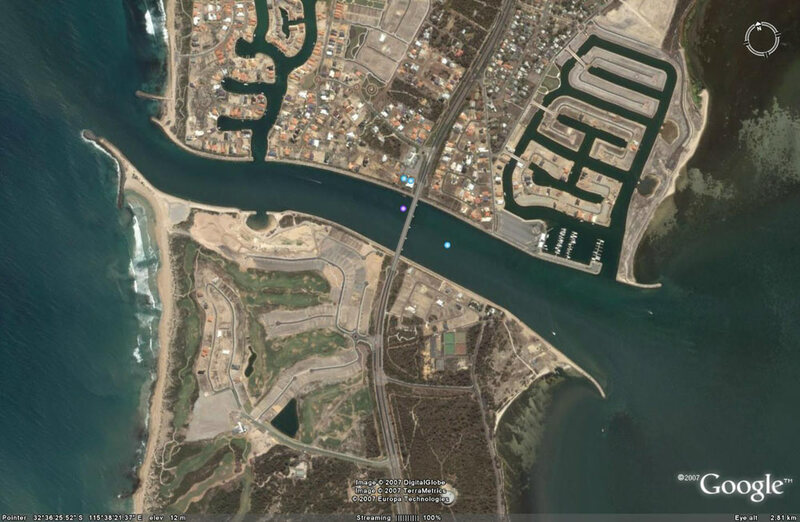 The third process involved dredging 180,000m3 from the boat harbour basin and canal entries and filling parts of the subdivision. A booster pump was introduced to allow us to pump 1,500 metres distance with a vertical head of 10 metres. A series of channels and gates allowed the free return of the wash water to the silt ponds for decanting back to the estuary. The project was finished on budget and on time and is now recognized as one of Western Australia’s most environmentally successful. It has transformed a smelly weed infested estuary into a clean waterway with increased wildlife recordings. As a result the population of the area has increased dramatically as has the resultant property values.